Marine-Plus.Com Wagner S50 Control Head 510-188 (Used. VG Condition, Yoke Mntng Brkt & Manual) For the Boating Community! Wagner S50 Autopilot Control Head ... Operate Your Autopilot Like NEW Again! $75.00 AFTER Return Of Control Head w/Bracket ... IF No Electrical/Water Damage! Replace Your Existing Control Head & Restore Yor Autopilot. For Wagner S50 (Series 50) Autopilot ONLY ... they use a Special Tach Mounted to MOTOR & Magnetic Compass Sensor attached to a Fluid Filled Flat Card Compass! 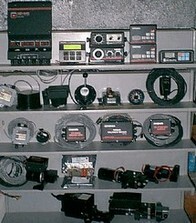 NOTE: Items Displayed in Picture Above during Bench Testing NOT Included with THIS Transaction, S50 Control Head ONLY! Those Items NOT Included are Available in Our eStore as of This Posting. 30 Day 'Service Return Policy' with an Additional 3 Months Free 'Service Labor Policy'… S&H Not Included.